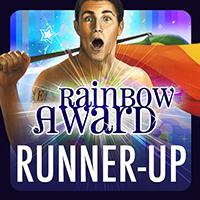 After seeing what awesome books/authors we were up against, I was stoked to be a Rainbow Award Finalist in the highly competitive Best Gay Contemporary Romance (William Neale Award) category. I mean, I love Jett and Goldie, but there was some seriously fierce competition. The one thing that I said and that I truly believe is that you can’t really feel bad not winning when so much talent and warm hearts are all around you. And while it’s generally against my nature to pay to enter a contest, I would have done it anyway because of Elisa, but to double down on this being something I believe in, the 2013 Rainbow Awards entry fees were given to the Ali Forney Center in NYC & Colors in LA. So I really feel good about this on multiple levels. Special thanks to Thursday Euclid (of course!) Loose Id, Rory Olsen, Jules Robin, Melanie Tushmore, Wendy Soto, Z Allora, the hubby, and everyone who loves rocker boys! Special thanks to you, Ambien, without which I am totally lost. In fact, I’m usually lost when I’m on you, but only in the best way. Me too, that made me so happy!